Toto is among the best toilet brands around the world. Today, we’re going to look at Toto Aquia dual flush two-piece toilet. This is a wonderfully constructed toilet with an elongated bowl design and a dual-flush mechanism, suitable for modern bathrooms. Toto Aquia and Aquia II feature almost identical. But, Toto Aquia price is more favorable than the Toto Aquia II. Read this Toto Aquia review article to know more about this toilet. 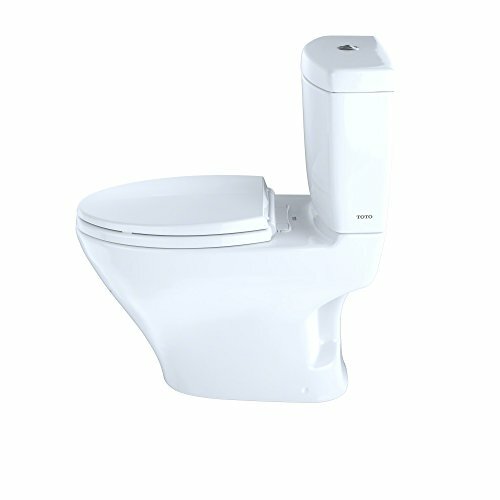 The Toto Aquia two-piece toilet is made of vitreous china material and a white finish. There are other colors to choose from but this is the most preferred one. Being a two-piece toilet, installing the Aquia toilet is easy and quick. It is also compact in design and will take up less space in your bathroom to allow you to decorate or include other items. Using the Aquia dual flush toilet is fun as it is easy to clean and less water is used. There is a button for 1.6 GPF and another for 0.9 GPF. The toilet is also ADA compliant as it is of a standard height but it is not fully compliant as the flush lever is located on top of the toilet. 4 Summary: Why buy Toto Aquia Toilet? At such a great price, this toilet is WaterSense certified and you may get a rebate in some states. If you are renovating your home and need an efficient and easy to clean toilet, the Aquia two-piece toilet should be on top of your list. Read on to know more about the Toto Aquia toilet. Toto produces some of the best toilet designs on the market. The Toto Aquia toilet is made of vitreous china material, with a chrome dual button flush trigger located in the top of the tank. The chrome buttons are not durable and you may have to change them every year. Additionally, the toilet features a semi-skirted base which has the clean appearance of a skirted design but has no risk of interfering with the water supply pipe at the center from the wall. The toilet seat is of the recommended height and ADA compliant but the flush lever isn’t as it is located on the top of the toilet. If you have kids at home, then this toilet seat is not ideal for them but just for adults. The toilet is also very comfortable to use as it has an elongated bowl design. If you know basic installation, there is no need to hire a professional plumber to install it for you as installation is straightforward and easy. The installation process is the same as the standard toilets. The toilet needs a 12-inch rough-in from the wall to the center of the waste pipe. Note that it has a 2,1/8-inch trap seal. Since it is a two-piece toilet, there is no burden as you can easily lift the toilet seat alone and then fix the tank after tightening the screws. You will require items like a toilet seat securing screws and the waste trap seal to finish the installation. Another feature that makes this toilet special is its ease of cleaning. You don’t have to clean the toilet after every use as a single flush leaves the toilet clean. Additionally, the toilet has an elongated bowl, which is easy to clean and the white color can easily reveal where dirt and stains are for a sparkling look. The semi-skirted design of the toilet not only make it look good, but cleaning outside is also made easy. You won’t have to brush around the crannies like in some toilets. The Toto dual-max flushing system makes the Toto Aquia be a perfect bathroom toilet. It allows the user to choose between 1.6 gallons of water per flush for a long call and 0.9 gallons of water per flush for a short call. Hence, no water is wasted and it meets the EPA WaterSense requirements. It is estimated that this dual flushing system will reduce your water consumption to 1.13 gallons per day. In some states, you might get rebates if you install the Aquia two-piece toilet. With such low water consumption level, we can say the toilet is eco-friendly. This toilet not only offers you comfort due to its elongated bowl design and standard height, but it is also compact and lovely. The toilet has a nice finish and touch that will add elegance to your bathroom. On top of that, it will take up less space as it is compactly made. So, if you want to have a modern look in your bathroom, this is a nice toilet to consider installing. Some people might shy away from this toilet because it comes with a one year warranty. But it is worth noting that despite Toto toilets offering just a one year warranty on most of its products, they are very durable and proven to last for more than 10-plus years. Thus, the warranty shouldn’t deter you from buying this quality toilet. Summary: Why buy Toto Aquia Toilet? The chrome buttons on top of the toilet are not very durable as you will have to replace them annually. The Toto Aquia dual flush toilet is a nice addition to any contemporary bathroom as it is compact and charming. Moreover, it meets most of the standards needed and it is easy to install since it comes in two separate pieces. The dual flush mechanism helps to conserve water making it be an environmentally friendly toilet. If you’re ready to change chrome buttons on top of the toilet every year, then this is a great toilet for you. Also, it cannot be installed in a public restroom as it comes with the flush lever on top of the tank. Generally, this is a wonderful toilet that will help you get rebates in some states and conserve water in the long run. I have explained everything this Toto Aquia review article that you should know about this toilet. Question: Does this toilet come with an elongated or circular bowl design? Answer: Looking from a distance, you might think that this is round or circular bowl design. No, it is not. The Toto Aquia dual flush toilet has an elongated bowl design that provides more seating space and comfort to the user. 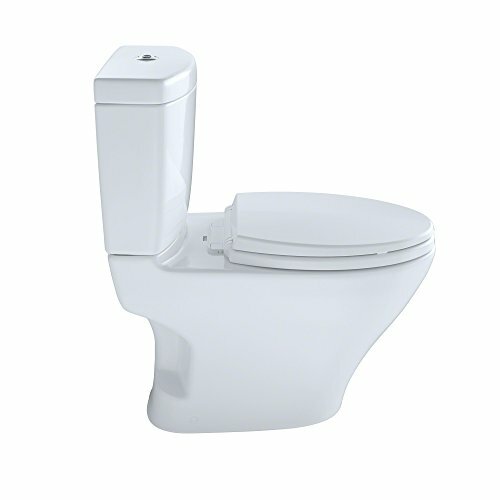 Question: What is the bowl height of Toto Aquia dual flush toilet? Answer: The bowl top has a height of 16-inches, while the seat top has a height of 17-inches. This is the recommended height, also referred to as comfortable seat height. In short, it is ADA compliant. Still, have a question after reading this Toto Aquia review? Comment below.